Queens produced their best performance of the season so far as they defeated SPL side Hibernian in this evening`s Scottish Communities League Cup clash at Palmerston with a display of quality attacking football that at times made their higher league opponents look very mediocre. The win saw Queens stretch their unbeaten start to the season to 7games, and to be honest they were not overly troubled by the visitors from the capital. 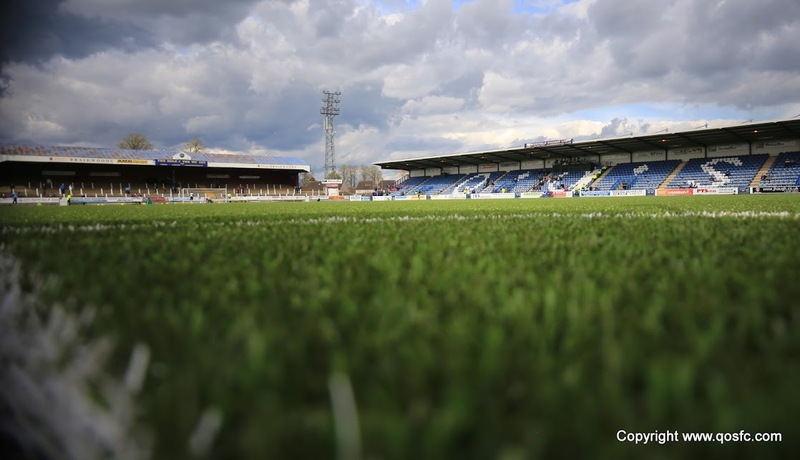 Following on from Saturday`s narrow victory, injury to Ryan McGuffie meant that Queens were forced to make a change in defence for the first time this season, with Dan Orsi being recalled to the team, and Chris Mitchell filled in at right back. Boss Allan Johnston, available again after his one game ban, decided against selecting himself for a starting role, and opted instead for a place on the bench. The visitors made several changes to the side that began in Saturday`s 2-0 victory over St.Johnstone at Easter Road, and gave a first start to veteran striker Shefki Kuqi. The game started with Queens attacking the Terregles Street end of the ground, but it was the noisy contingent of travelling Hibs fans who were first to offer encouragement to their side as a shot from Leigh Griffiths went over the bar just 4 minutes of play. In the early exchanges the SPL team looked composed on the ball, and with Griffiths looking lively, it appeared that the home defence were going to be in for a hard night, however as the game settled it was Queens who grew into the game, and slowly but surely began to dominate the play. The pace on either wing of both Orsi and Dan Carmichael soon started to produce openings for Queens, and it was Orsi`s speed that won the first corner, but sadly Mitchell`s inswinging delivery was too near `keeper Williams who collected the cross under no pressure. As the action switched to the other end, Queens received a mighty let off when Griffiths somehow managed to knock the ball onto and over the bar from about 2 yards out, too be fair to him the ball did arrive quickly, but it really should have been the opening goal for the visitors. However, the opening goal was not long in coming and it was Queens who took the lead on 12 minutes. A nice one-two involving Carmichael and Derek Lyle saw Carmichael break away down the right and his pinpoint low cross was met at the near post by Nicky Clark who tapped the ball in to round off a move of top quality.Queens were certainly boosted by the goal, and they began to pass the ball around with purpose and accuracy as the visitors struggled to get involved in the game. In midfield Derek Young and Stephen McKenna were controlling the game, and with Queens attacking at pace the Hibs defence were under constant pressure. Allan Johnston was forced into making an early change after 22 minutes with Gavin Reilly replacing Derek Lyle, and with even more pace added to their frontline, Queens looked even more impressive as they searched for a 2nd goal. 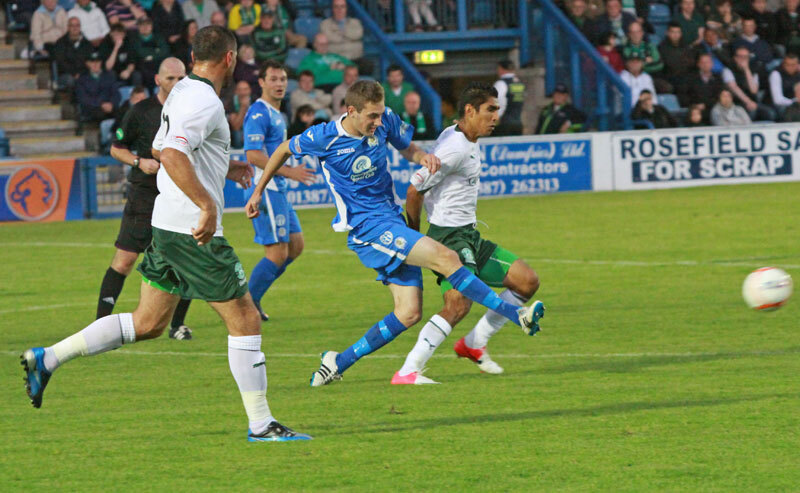 After 35 minutes Hibs had a half chance when Kuqi drove a shot straight at Lee Robinson, but it was Queens who had the best chance to score a second goal after Orsi`s neat pass found Clark, but after brilliantly setting up a shooting chance, the striker placed his shot past the `keeper but also wide of the upright. The game was certainly an end to end affair, and Hibs danger man Griffiths squandered a further chance on 40 minutes after finally shrugging off his marker and bearing down on goal, he blasted well over from a good position. If that shot had gone in the game might have had a different outcome, and just 2 minutes later, Queens extended their lead with another well worked and well executed goal. A delightful reverse pass from Mitchell sent Carmichael away down the right and once again the winger delivered an inch perfect cross to the back post where an unmarked Gavin Reilly dived full-length to head the ball in from 4 yards out to send the Queens contingent in the crowd of 2658 into sheer delight. The 2 goal advantage was very well merited and the home side left the field at the break to a much deserved standing ovation after controlling the majority of the first period. At the interval Hibs made two changes with Maybury and Wotherspoon replacing both full-backs, Booth and Kujabi who had both suffered a torrid first 45 minutes, and almost from the kick-off an effort by Griffiths from a free-kick nearly produced a goal, but the alert Robinson was able to react well to push his shot away for a corner. From the resulting set-piece the ball broke to Deegan on the edge of the box but his drive was well wide of the target. Minutes later Queens went close on a couple of occasions, firstly with a shot from Reilly, and then from a header by Clark as they looked for the 3rd goal which really would have sealed the game. They then created an even better chance after a counter-attack led by McKenna who found Orsi who in turn played in Reilly, but the young striker lacked a bit of composure and his hurried shot was unfortunately way off target. The early threat at the start of the half from Hibs never really built enough to cause Queens too many problems, although briefly following the introduction of Doyle they did look as though that might make a fight of it, as a shot from Cairney was defelected for a corner, and O`Hanlon went close with a header from the resultant set-piece, but really Lee Robinson had a pretty quiet game. With 14 minutes to go Willie Gibson replaced first scorer Nicky Clark who had run himself into the ground as Queens left Reilly up front on his own for the final minutes of the game. As the clock ran down Queens played out the last moments by holding onto the ball as best they could, although well into stoppage time Hibs almost got a goal back when a header from Wotherspoon was saved low down by Robinson. The game ended in curious fashion with a clash in the far corner of the pitch, it seemed everyone was waiting for a free-kick to be given, but the referee picked up the ball and began to walk from the pitch which was the signal for the celebrations to start after what was a memorable result for Queens. Fantastic performance and result for Queens, no need for any one man of the match as after tonight`s display the whole team should be delighted with their effort. Sorry, no highlights are available for this fixture yet. 19:22 Hello and welcome to Queens against Hibs in the League Cup 2nd Round at Palmerston. 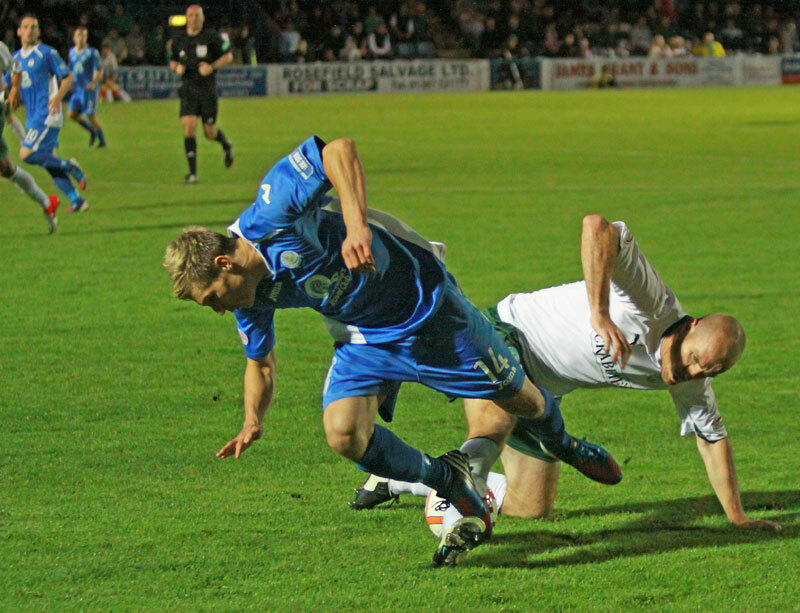 19:37 Looks like Ryan McGuffie couldn`t recover from the clattering he took on Saturday that resulted in the red card for Albion`s Gilmartin. 19:40 Hibs have been in good form this season, beating St Johnstone and St Mirren in their last 2 games whilst Queens are still unbeaten after 6. 19:44 The teams last met in 06/07 with Hibs winning 2-1 at Palmerston in a Scottish Cup tie. The Doonhamers will be looking for better tonight. 5 min First effort on goal as Griffiths puts a free-kick harmlessly over Robinson`s bar. 9 min Shaky defending at the back for Queens as Durnan misses his header but it comes to nothing. 12 min Griffiths hits the bar! A nothing cross bobbles through the box and Griffiths throws his leg at it and the ball loops onto the bar. 14 min Carmichael comes alive down the right and delivers 2 great crosses. The 2nd finds Clark at the near post to side-foot in. Great start! 17 min Queens defending well as Cairney puts in a testing cross which Higgins puts behind. The corner comes to nothing. 20 min Lyle is getting some treatment on the sideline as Higgins puts in an inch-perfect tackle on Griffiths. The Hibs striker looks dangerous. 24 min Straight swap for Queens as Derek Lyle can`t continue and young Gavin Reilly comes on up front. 26 min The crowd cry `handball` as Young tries to beat Claros inside the box but the Honduran falls on the ball with his arm but the ref plays on. 29 min So far Hibs have controlled much of the game without creating any real chances whilst Queens have looked to counter-attack. 37 min What a chance for Clark! Orsi skips past his marker and plays in Clark who`s 1st touch nutmegged a defender but he put his finish just wide. 38 min That would have been a real classy goal if Clark had found the corner and would have put Hibs in a really difficult position. 39 min Griffiths chance! Hibs finally find a way through the home defence as Griffiths races through. He should score but he blazes over. 42 min A loud cheer goes up as McKenna smashes a clearance straight into the midriff of the referee. That looked a sore one. 44 min The goal comes from Carmichael again as he hits the byline and finds Reilly unmarked at the back post to head home. 45+1 min Griffiths tries a free-kick from 35 yards, he strikes it well but it`s well over. He`s getting some amount of stick from the Queens fans. Half Time What a first 45 for Queens! They`ve had the better chances and taken 2 of them. They`ve defended solidly enough as well. Half Time The SPL side have looked more comfortable on the ball but Queens pacy forward line has surprised them big time. 45 min Hibs subs: Maybury for Kujabi and Wotherspoon for Booth. 46 min Straight away Hibs test Robinson as Griffiths curls a free-kick from wide towards the near corner but Robinson dives full stretch to save. 54 min The Queens front line is dwarfed by the Hibs defence and are winning every high ball put forward. Queens need to get the ball on the floor. 54 min Reilly does well to cut inside but his shot deflects over. 56 min Great play again from Carmichael as he torments his marker again and whips the ball onto Clark`s head who heads over. 63 min Great counter attack by Queens! McKenna strides out from defence and picks out Orsi`s run finds Reilly but he sklaffs the shot wide. 65 min Sandy Clark is getting a talking to from the ref. I think he feels that some of the Hibs fouls should have been punished with yellows. 67 min Scary moment in the Queens defence as Durnan miscues a clearance straight across the goal mouth but there are no attackers there to benefit. 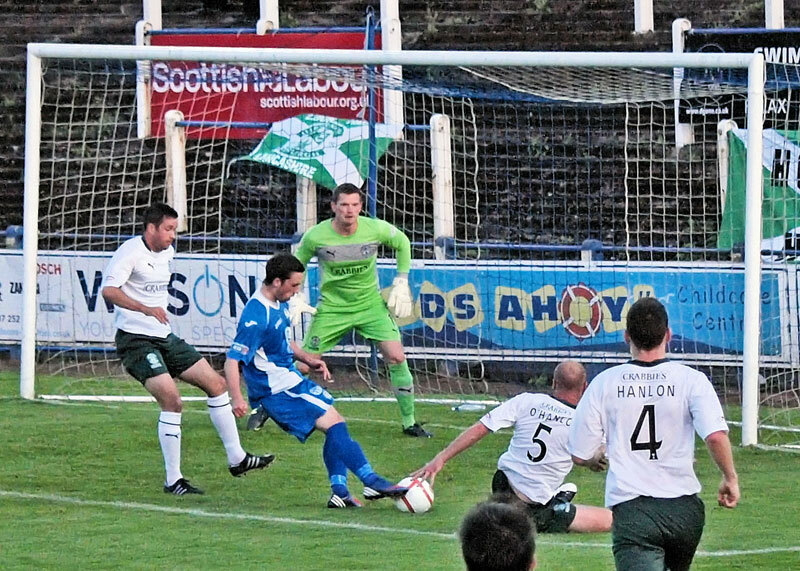 70 min Queens pressing again as Derek Young smashes a thunderous drive into a Hibs defender. That was some hit and looked on target. 72 min Hibs threaten as Cairney has a shot deflected over. From the corner O`Hanlon heads onto the top of the net. 79 min Clark was hobbling a little as he went off. Looks like Queens are going 1 up top with Gibson in behind. Cracking performance from Clark. 86 min Hibs attack but the final effort is a weak header. Some of the Hibs fans are leaving already. 87 min It`s been a good 5 minutes for Queens as they keep the visitors pinned inside their own half and look to run down the clock. 89 min Orsi was lucky not to get booked as he wipes out Wotherspoon but the ref is keeping his cards in his pocket. 90 min More jeers as Griffiths mucks up a volley inside the Queens box. 3 minutes stoppage time. 90+2 min Good save by Robinson! 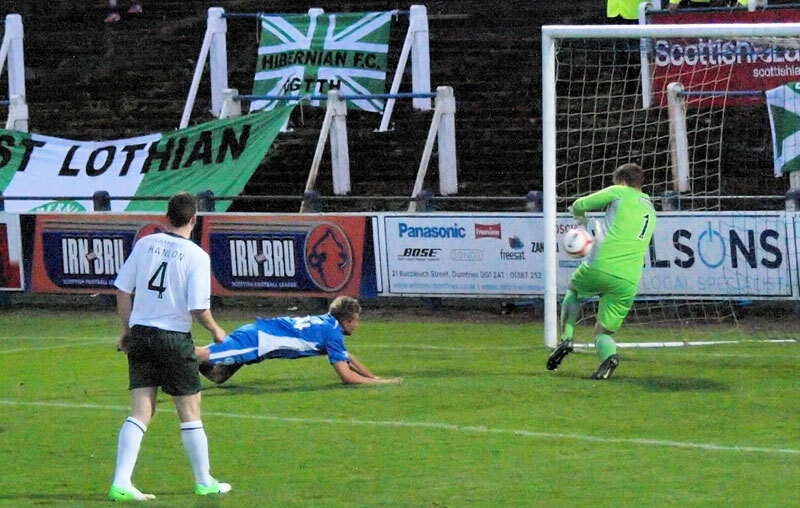 Hibs get in down the left and the cross finds Wotherspoon in the middle but his low header is stopped by the `keeper. 90+3 min Queens have the ball in the corner and look to play the game out. 21:35 A cracking performance and result to go with it as Queens knock out SPL side Hibs in a deserved victory.